Although companies and businesses are going digital more and more, there are still those that pile up the paper trail. Not to mention that there are those that neglect the disposal of office equipment and other clutter that comes up during work hours. 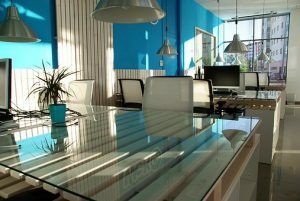 Hence, it is all the more important to make sure to make your office look as clean and clear as possible. Otherwise, you risk giving potential customers the wrong impression about the quality of your company and business. And this is where the use of our commercial storage comes into play. Safe and reliable, we offer you the perfect storage units Columbus, OH to ensure a clean slate and office space. Our commercial storage will ensure maximum safety at affordable prices. No need to waste time on additional office space or to pile up paperwork for all clients to see. Instead, simply turn to the convenience of our commercial storage services and ensure smooth business operations. We can make sure that the entire process is taken care of, from top to bottom. We get to your location with our Zippy Shell trailer, pack everything and load it up. Then, we will transport it and unload it in our storage facility – minimal business disruption and maximum efficiency. We also offer temporary climate controlled warehousing solutions or onsite storage solutions for seasonal inventory needs. You can count on inventory shipment receiving services, temporary storage, and safe delivery to your new business location. Just for your business – our commercial storage space provides the highest level of protection for your goods. There are many business owners that use storage solutions for their businesses. From home builders, realtors, to pharmaceutical and equipment rental businesses, our storage units have solutions for all of them. If you are thinking about expanding your business, or you just need extra space for your business equipment, please contact us to find the best commercial storage for you in Greater Columbus. You will get the best possible care and solutions for your storage needs. Our facility managers are experienced in working with many different types of businesses. So, you can be sure you’ll get the best possible help. There are many advantages of renting our commercial storage in Greater Columbus. The cost for our commercial storage units is lower than renting the commercial real estate. We do not put the time frame on your commercial storage lease. At Zippy Shell Greater Columbus all our facilities offer you different types of lease arrangements. All that, for your convenience. All our storage units come with many different features. You can count on safe and climate controlled space where you can store your precious belongings with no worries. You can always contact us to get more information about the additional benefits. Business storage at Zippy Shell is your best business partner. Our storage solutions are the crucial postulates of your and our business operation. 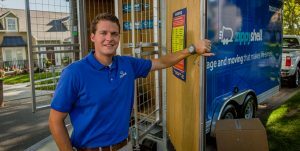 With our storage managers, you will get a person who is capable and dedicated to work with you to store your hoods listening to your needs. We provide long-term and short-term commercial storage units in Greater Columbus. Once your items arrive at the facility our staff will handle it and prepare it for the storage. Also, we can arrange for you portable containers so the pick up of your goods can be done in a front of your business building and transported to our facilities with utmost care. Many businesses need extra space to store their goods. But, many businesses lease commercial real estate that cost a lot more than good commercial storage. In the last few years, the rent is increasing quickly, so the businesses spend a fortune to store their goods. We have a lot more convenient and affordable solution for you! You can store your belongings without breaking the bank! Rent commercial storage unit in our facilities in Greater Columbus. Zippy Shell is always working to your convenience to provide you with safe and affordable space. With high rents and limited inventory space available in commercial real estate, the best financial thing you can do is to store in the commercial storage. You are always more than welcome to give us a call to get more information about the services our commercial storage offers. We are here to ensure the safety and security of all your goods. Feel free to fill the quote on our website to get a free estimate. Our flexible storage solutions are an important part of transporting your business goods. Moving projects can be very stressful. Especially when it comes to moving your business items. Our onsite containers can remove the stress and pressure of logistics tasks. Renting portable storage containers from our company is the best flexible solution for moving, transportation and storage. Our specialists are trained to handle the transportation of your belongings to commercial storage with best quality and weather resistant portable storage containers. Our professionals are ready to meet all your needs efficiently and effectively. With our assistance, your businesses items will find a safe place where you can always have easy access. Whether you are changing your business address, or you are remodeling the existing office, we offer commercial portable storage containers to fit your needs easy transportation. Our portable storage containers can transport equipment and materials for any business. Our flexible storage solutions are an important part of transporting your business goods. 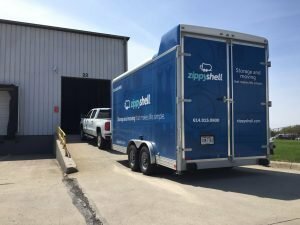 With Zippy Shell, Greater Columbus commercial move is a success! With our portable storage containers and safe commercial storage facilities, your entire commercial relocation is in safe hands. We transfer your goods in the most convenient and cost-effective way. Our agents are always ready to help with every task during your commercial relocation. We know the best – every business is different and requires a specific approach. The nature of your products and your demands require a customized moving plan. Contact Zippy Shell for more information and rent your commercial storage space today.